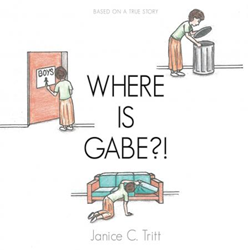 True life stories of lost children inspired Janice C. Tritt’s new book, WHERE IS GABE? !, ($11.99, paperback, 9781545605349; $22.99, hardcover, 9781545605356; $9.99, e-book, 9781545605363) about a young boy, Gabe, who slips away from his grandmother in a large building, she must do everything she can to find him—including seeking help from others to work against the clock in search efforts and pray for his safe return. Janice C. Tritt is a retired dental assistant who know enjoys spending time with her grandchildren. She is also the oldest of five sisters, which always made her feel like the “mama figure”. She knew writing a book for children, written from a grandparent’s perspective, would share the message of unconditional love all grandparents have for their grandchildren. Xulon Press, a division of Salem Media Group, is the world’s largest Christian self-publisher, with more than 12,000 titles published to date. Retailers may order WHERE IS GABE?! through Ingram Book Company and/or Spring Arbor Book Distributors. The book is available online through xulonpress.com/bookstore, amazon.com, and barnesandnoble.com.